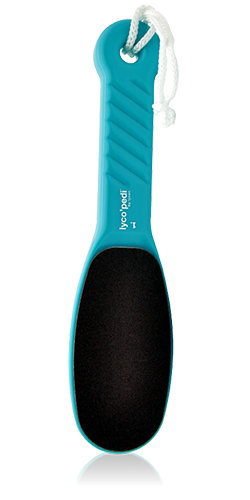 The lyco’pedi paddle is ergonomically designed, comfortable to use and does all the hard work in removing dead skin build up. With a coarse and fine side it’s perfect for a professional smooth finish. The Pedi Paddle can be used on wet or dry skin and is 100% sanitisable. Also recommended for regular maintenance at home for perfectly polished feet! Pair the Pedi Paddle with our hardworking Callus Remover to achieve even more amazing results! 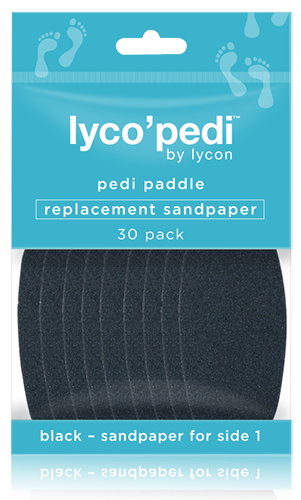 The pedi-paddle replacement sandpaper can be easily swapped over easily in between pedicure treatments, ensuring a sanitary pedicure every time. The pack includes both fine and coarse grades to cater for all types of feet.